Indigenous Cape honeysuckle is a versatile shrub that is ideal for water smart gardens. 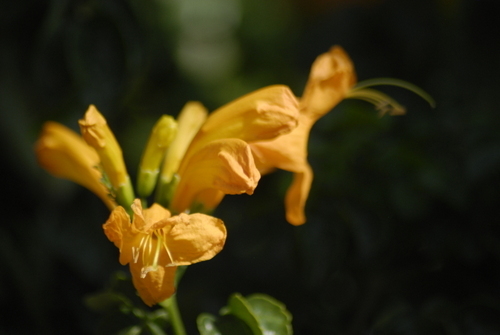 The Cape honeysuckle (Tecoma capensis) is one of those extraordinary plants that looks as if it needs a lot of watering and pampering, but in fact is a tough shrub that survives heat, drought, coastal conditions and wind. It will even grow in poor, sandy soil. The only condition it will not tolerate is protracted winter frosts below -5°C, although it will survive the occasional cold night with temperatures of -8°C if well protected. 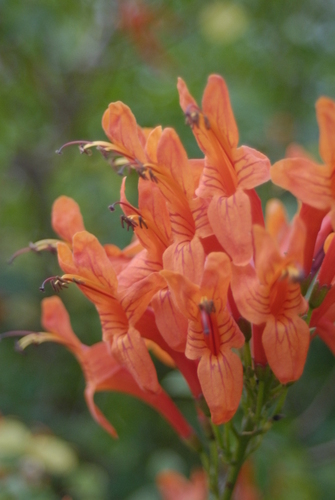 Although there are 12 Tecoma species, only Tecoma capensis is indigenous to South Africa. It occurs naturally in Limpopo, Mpumalanga, KwaZulu-Natal and the Eastern Cape. 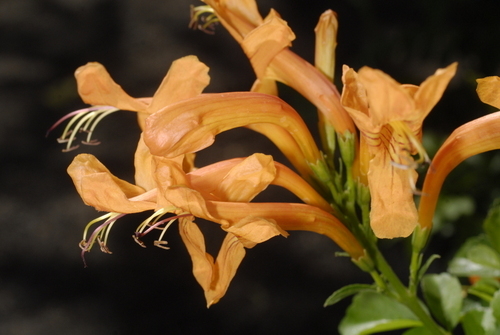 The pretty tubular flowers of the Cape honeysuckle occur in fairly large clusters above the foliage. It blooms prolifically all year round in tropical conditions, and from late summer to winter in colder climate. The glossy green leaflets give the Cape honeysuckle a delicate appearance that is unusual in drought tolerant plants, and make it a valuable plant for foliage contrast in water wise gardens. The nectar-rich blooms attract nectar-eating birds, particularly sunbirds. 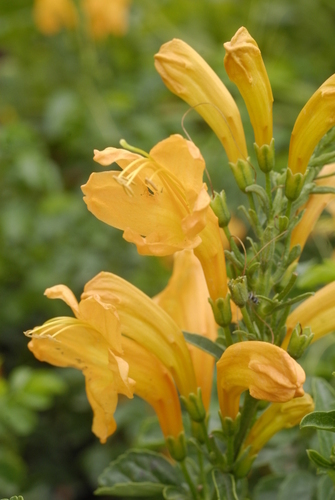 Tecoma capensis is also an excellent choice for attracting butterflies, as it provides nectar and is host plant for a number of butterflies including the lucerne blue and the rarer common blue. This fast growing, scrambling shrub can reach a height of 4-5m with a similar spread in warm subtropical regions where it remains evergreen all year round. However, when planted in gardens with mild frost, the height and spread are about 2-2,5m, and it loses its leaves when frost levels are below -2°C. Heavier frosts can cut back the plant but if well protected it will re-grow in spring. 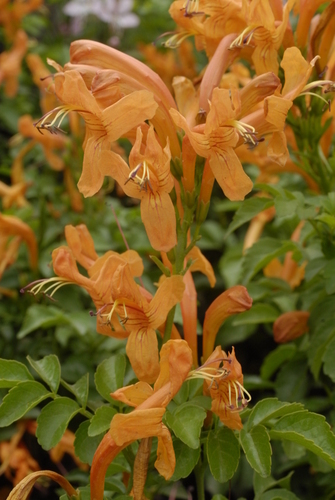 Plant breeders have now developed a number of differently coloured Tecoma capensis cultivars in shades ranging from deep red through to orange, apricot, gold and lemon yellow and even a marvellous salmon-pink. The blooms of all these cultivars stand above the foliage and contrast superbly with the glossy green leaves. 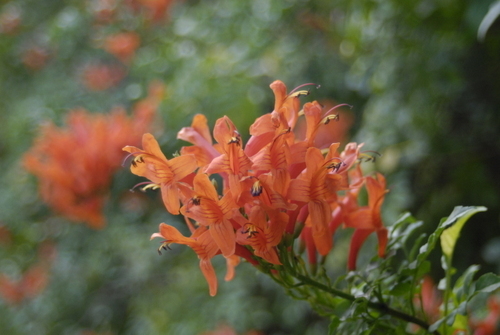 The cultivars tend to be smaller than the original orange-bloomed Tecoma capensis. Plant in compost enriched soil that drains well. For the best blooms plant in full sun, although Cape honeysuckle will tolerate partial shade. Keep the soil around the plant moist at all times until the plant shows signs of new growth. Then water deeply but infrequently. In frosty areas protect young plants with a thick mulch and a cover at night. Prune back the branches in late winter to keep it neat and tidy and to promote new growth and flowering. Apply a balanced fertiliser after pruning to enhance growth and flowering. Propagate in spring from cuttings or rooted suckers. As an ornamental shrub at the back of the border. As a screening plant to block out an unwanted view or unattractive outbuilding in frost-free gardens. As a climber against a wall. It will need to be tied to a support and pruned to an espalier shape. In massed plantings in large gardens or down a driveway. As a butterfly and bird attracting shrub in an eco-friendly garden.